Non fiction or fiction? It’s difficult to decide how to describe this book because The Prehistoric Masters of Literature takes dinosaurs and turns them into the authors of classic literature. It’s a mashup that introduces the writers and summarises their lives and achievements from the perspective of the prehistoric reptiles. Who else but William Shakespeareasaurus could have such a “ferocious talent”? Along with the story of each prehistoric literary master and their work comes a mini book that abridges a famous story in prehistoric style, followed by a biography of the writer’s real life doppelganger. They are accompanied by colourful illustrations of dinosaur-filled scenes. The authors covered include: Shakespeare, the Bronte Sisters, Edgar Allan Poe, Mark Twain, Charles Dickens, and Jane Austen. 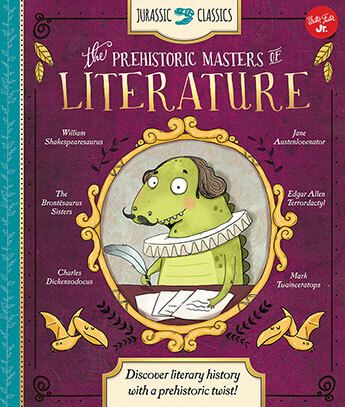 The Prehistoric Masters of Literature is a fun way to encourage an exploration of the classics. Probably best suited for upper primary, you could start by reading the fictional story, then compare it with the facts to see what they have in common and how each have been given a prehistoric twist. Perhaps budding writers will also want to have a go at creating their own prehistoric version of a true story!